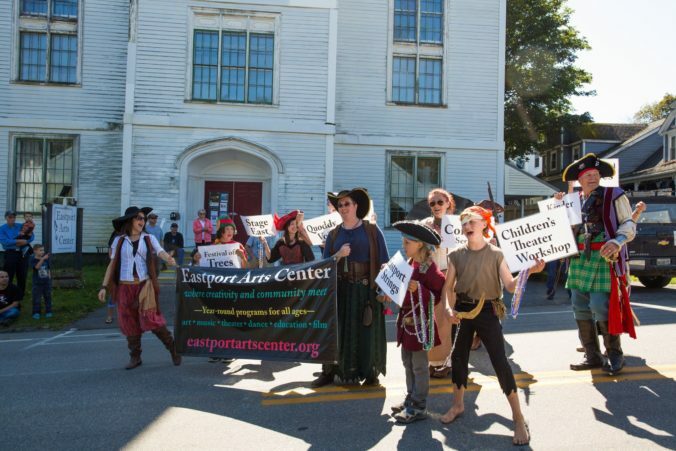 Following on the heels of fire-breathing performers, the EAC group, proudly displaying our new banner and carrying signs naming the 7 constituent groups as well as several annual events and recurring programs, marched the parade route, singing an extemporaneous rendition of the drunken sailor song featuring many EAC-themed verses. To the repeated cry of “What shall we do with a drunken sailor?” were chorused replies such as, “Give him two tickets to the Concert Series,” Make him sing tenor in Quoddy Voices,” “Send him to the International Dinner!” and many more. The boisterous group included: John and Anne Franklin, Kieran Weston, Cadence and Zephyr Nickerson, Jenny Robish, Manuela Brice, Kathleen Dunbar, Lane and Jim Willey, Sally DeCicco, Jeanne Peacock, Steve Koenig, Christina and John Smith, and Lauren Koss.